As Hungarian Grands Prix go, last Sunday's was a pretty good one. Yet even so its drama rather paled against that of the rumour that kicked off in the hours after the race: Fernando Alonso to Red Bull for next season. No, really. Alonso to Red Bull, for 2014 in any case, seems to fail the plausibility test, and spectacularly. At least it does for as long as Sebastian Vettel is in place at the Milton Keynes team. To pair Alonso and Vettel seems not so much asking for trouble but pleading for it; it's almost impossible to think of a modern F1 pairing that would more fly in the face of the 'don't put two bulls in the same field' maxim. There is also the not small matter that as far as everyone was concerned Alonso is just in year two of a Ferrari contract that stretches all the way to 2016. 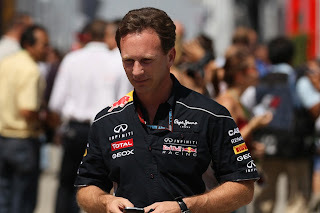 The rumour seemingly is resultant of Alonso's manager, Luis Garcia Abad, talking to Red Bull team principal Christian Horner in the Hungaroring paddock. Yet, managers talk to team principals all the time (it's possible the whole story's a result of someone putting two and two together - and getting 17), and in any case the official line was that the discussion was about Carlos Sainz Jr., another client of Abad's and in the Red Bull stable of young drivers. Yet also, conspicuously, neither Alonso nor Horner actually ruled the prospect of a move out when it was put to them after the Hungarian race. In both cases it was non-denial denial, playing the prospect down but stopping rather short of shutting the door. So, what's going on? In Alonso's case, however the rumour originated it seems rather in his interests for the prospect to be out there. In what looks to be year four in which Ferrari has failed to provide him with top-notch machinery it's a timely warning shot across the bows of his own team. 'Don't take me for granted' is the clear message. And as Joe Saward noted too, the rumour might, just might, sow the odd seed within Red Bull of the idea of replacing its star man Vettel with the Spaniard. It's a remote prospect, given Vettel's status within the Red Bull team, but hey there's no harm in trying. Particularly given the extent of post-Malaysia intra-team ructions remain unknown. And equally for Alonso it might have the added bonus of irking Vettel a bit too. Christian Horner - reason to look pleased? Quite why Horner is happy to let the story run for a while longer is less clear. Perhaps he just thinks it'll unsettle Ferrari, and that he has nothing to lose from this. But perhaps also the vague idea being out there of Alonso joining is in his interests too, in that it strengthens his hand in recruiting the driver to fill the vacancy created by Mark Webber from next year. There has been speculation (though not based on a great deal that is concrete so far as I can tell) that Vettel might prefer Daniel Ricciardo as his stable mate to Kimi Raikkonen. However, no sooner had the Alonso story broken as Seb was talking in his most positive terms yet in public about being paired with Kimi, possibly as it reflects a much lesser evil. So, if this was part of Horner's motivation then it's had immediate reward. 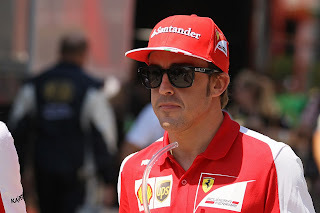 Furthermore, Kimi's manager Steve Robertson is well-known for extracting lucrative deals for his client, yet perhaps the Alonso prospect hanging in the air somewhere will take some of the sharp edge off Robertson's demands. Silly season is not called that out of any sort of irony: its silliness can often beggar belief, and often - as appears so in this case - rumours reflect ulterior motives and curve balls rather than genuine prospects. Alonso almost certainly won't be in a Red Bull come the opening round of next season. But for the reasons I've given, and maybe more, we'll likely have to put up with a frenzy over it for a little while longer. Perhaps Horners angle in the non-denial had to do with trying to wrest control of the team back as well. Post-Malaysia (or, rather in-radio messages) - it was fairly obvious that if the best Horner could do to rein Vettel in was "Come on Seb, this is silly", as compared to Ross Brawns "Hold!" , he needed to do something to get the upper hand back. Good point Seamus - it could well be that Horner wants to remind people (including Seb) who the boss is.